The GefenTV Wireless for HDMI 60 GHz extender system sends high definition audio and video to any HDTV display up to 33 feet (10 meters). It extends HDMI A/V content from computers, set-top boxes, and Blu-ray players to a remote HDCP-compliant Hi-Def display. It is designed for in-room transmission, as it will not work through walls or floors. Gefen's new Wireless for HDMI 60 GHz is designed for any in-room transmission of high-quality, 1080p full HD video up to 33 feet (10m). It delivers 3DTV, is plug and play and supports all audio formats including the new lossless High Bit Rate (HBR) 7.1 channel Dolby True-HD and DTS-HD Master Audio. The ability to pass through uncompressed video, lossless audio and 3DTV is ideal for cutting-edge, high-performance commercial or residential installations. This extender uses the best technology currently available for an impeccable method of wireless extension that takes full advantage of the WirelessHD specification, which is based on the 60 GHz EHF (Extremely High Frequency) radio band. This high-quality method of extension eliminates the need to run cables, making it a great solution for retrofits or any environment that wants to streamline cabling. The editors of Electronic House magazine gave a formal nod to this new extender from Gefen by awarding it a Product of the Year award for 2014. Endowed by a panel of distinguished industry leaders and the editors of Electronic House and CE Pro, Gefen joins an exclusive group of products deemed the most noteworthy. 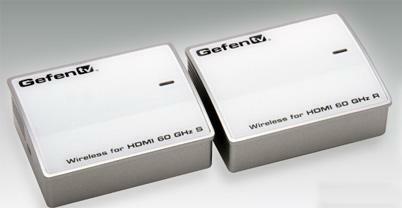 Announced on January 7, 2014 at the International CES in Las Vegas, Nevada, the GefenTV Wireless for HDMI 60 GHz was selected as best in the A/V cables and interconnects category. Due to its in-room transmission and use of the uncluttered 60 GHz frequency band, this extender can perform seamlessly alongside other wireless devices in adjacent rooms with zero interference. It is very easy to install, requiring a connection of the video source to the sender and of the display or projector to the receiver. Content is transported wirelessly at 4Gbps from source to display. This extender also features a small footprint and a compelling MSRP. Included is a risk-free warranty backed by Gefen's reputation and well-regarded support team.